On April 23rd, 2014, Wisconsin Governor Scott Walker signed a new law that was the first of its kind in the nation. The new law requires an independent investigation of police officers when someone dies or is killed while in police custody. It’s an important new law for many reasons, but none more important than the fact that police departments and officers across the county often elude accountability and transparency by conducting internal investigations of shootings and civilian deaths involving their officers. The police get to investigate themselves and determine whether a crime has been committed when someone dies in their custody. As to be expected in a system that judges its own, most police officers walk from these incidents with barely a slap on the wrist. As Michael Bell, Sr. and the Journal Sentinel dug deeper into the police officer’s story about the shooting they discovered problems and evidence quickly accumulated that disputed the officer’s official narrative. The Michael Bell Jr. case is now remembered by flawed evidence to justify the shooting and police cover-ups. Bell Sr. was ultimately awarded $1.75 million in a federal civil suit against the City of Kenosha. 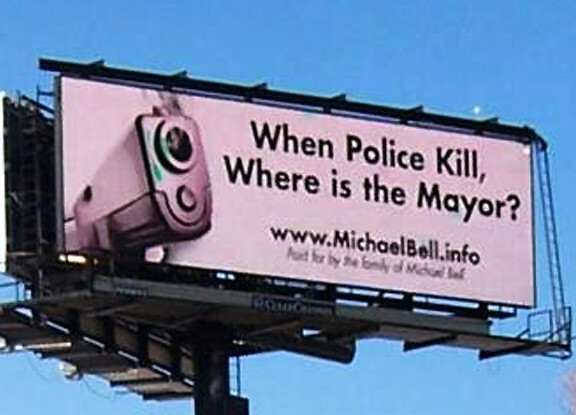 But Michael Bell Sr. was not interested in a payout and put the money towards an aggressive billboard, print advertising and website campaign to raise awareness about his son’s killing and other deaths in police custody that occurred across Wisconsin. 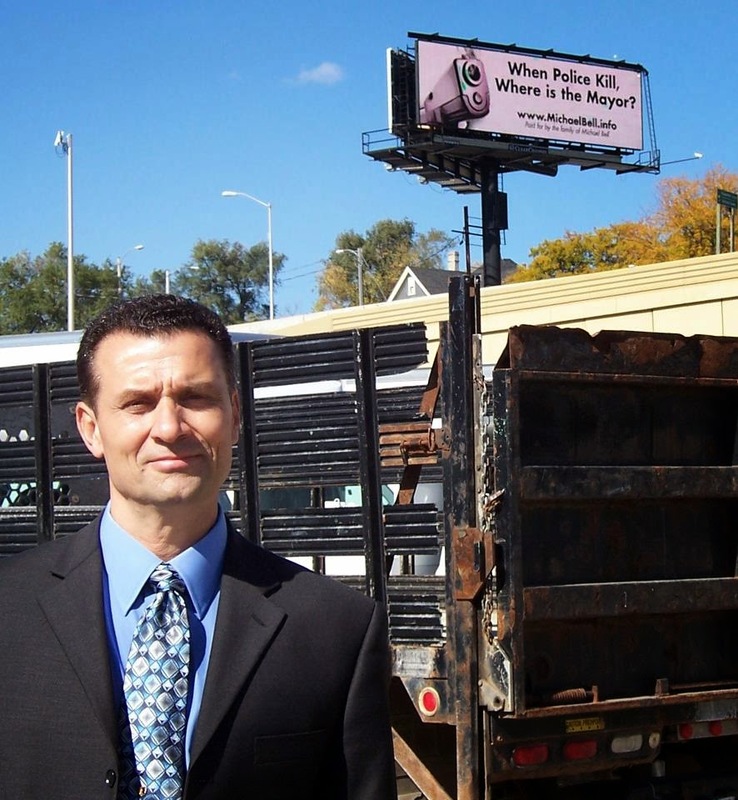 Michael Bell, Sr. stands in front of an advocacy billboard. Several subsequent high profile cases that Bell Sr. lent his advocacy efforts to were Derek Williams, who died in the back of a Milwaukee police car after pleading for help and gasping for breath and Paul Heenan, who was shot by Madison police while he was intoxicated. Michael Bell Sr. was kind enough to talk with crushplate about his ten year effort to get this law passed. 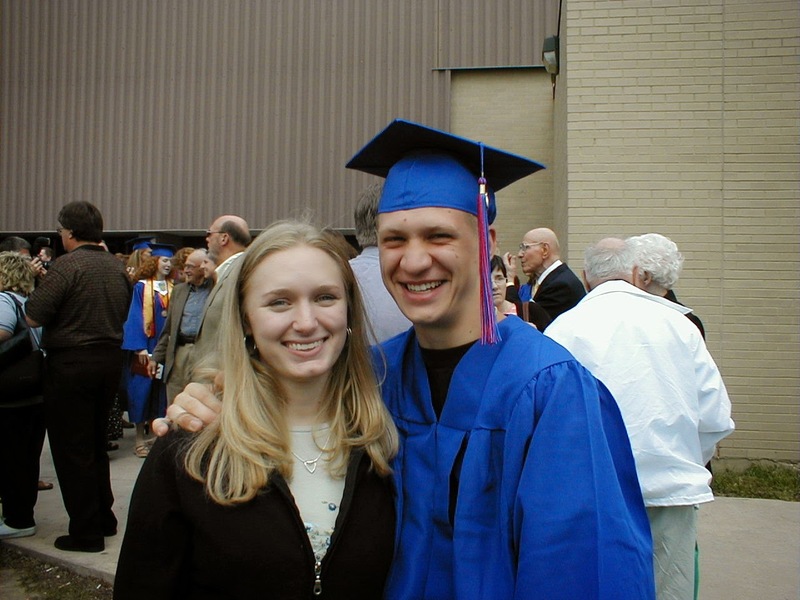 Can you tell us about the fatal encounter between your son and the Kenosha Police Department? My son was coming home from a night out with friends. A police officer was up the street as my son drove past him. Police video shows no wavering, fluctuations in speed or any other reason he should have been stopped. He was driving another man’s vehicle. He stopped in front of his house as the officer arrived. The officer accused him of running a stop sign and pulls him off camera. My son asks why are you kicking me, I’ve done nothing wrong. Essentially, he gets tased, and runs to the back of his home. His mother, sister, and three neighbors witnessed a “Rodney King” style beating. At some point an officer says “he has my gun” and he is bent over with his hands behind his back, being held down by a police officer. Another officer runs up and places a gun directly to my son’s head (while mother and sister watch) and shoots a bullet into his temple. Dash cam footage from the night Kenosha police shot Michael Bell, Jr.
What were the most troubling parts of the Kenosha Police Department’s internal investigation into the killing? As a United States Air Force officer and pilot, the investigation was the polar opposite of what I experienced in aircraft accident investigations. Within two days, before witness statements were even taken, before an autopsy was complete, before crime labs reports were done, the Kenosha Police department had a number of its officers hold a review board, claiming the shooting was justified and clearing themselves of any wrong doing. When did you realize that you couldn’t accept the official narrative that the Kenosha Police Department police had put forth? Several major moments lead to this. Grief counseling in which family members described what they saw, the quickness of the investigation without even the hint of correctness, (my son’s fingerprints or DNA were not on any gun or holster) officers were not tested for alcohol or other substances, the District Attorney refused our request for an inquest and just three months later, as he was investigating another police shooting and running for circuit court judge, he was being endorsed by every police chief in the county. He refused the family’s request for an inquest and also found the other shooting justified.This link help better explain. Family photo of Michale Bell Jr. on graduation day. Why do you think accountability and transparency are important when someone dies in police custody? Our research has not been able to find a single ruling of an “UNJUSTIFIED” shooting by a Wisconsin Police & Fire Commission, a police department or an inquest jury since the systems were formed in 1885. And only one unjustified ruling by a DA and that ruling was after the department was involved and an inquest jury cleared itself of any wrong doing. A government agency that has the right to take a human life without checks and balances, must insure that the power of life and death is not abused. And our community must be guaranteed that the officer was in a clear frame of mind if he/she decides to pull the trigger. How did your group work with other groups or families that faced similar circumstances? A number of high profile cases occurred and we placed billboards along the highways, and ran television, newspaper and radio ads to bring awareness to our message that “When police kill, should they judge themselves” to support them. 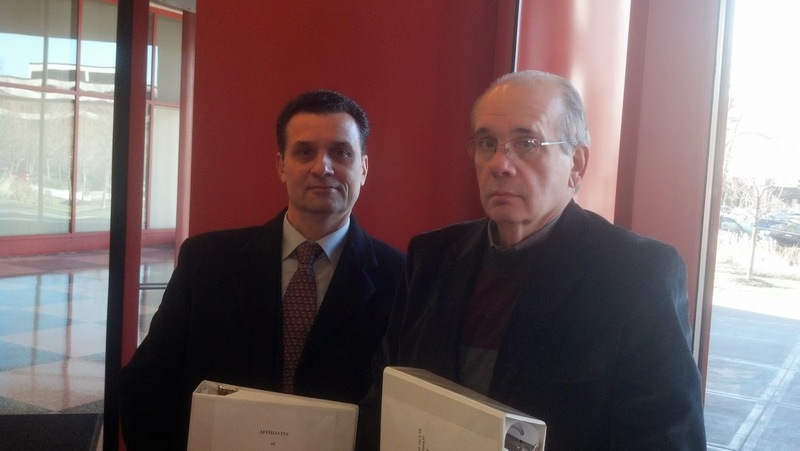 Our family settled a federal civil rights lawsuit and refused a confidentiality agreement so that the data in my son’s case was available to the public. At one point, our family supported the family of Derek Williams Jr. by placing 43 billboards along major Milwaukee thoroughfares. Traffic Audit Bureau data suggested that those billboards were being seen by 12.5 million people per week. Can you describe how both your efforts and the reporting at the Journal Sentinel complimented each other to get this new law passed? The relentless reporting of the Milwaukee Journal Sentinel, FOX 6 Milwaukee, Wisconsin Public Radio and the Kenosha News, brought a new level of awareness to the public. When the public learned the facts, they couldn’t believe that a system like this was in place. Our billboards, TV ads, and newspaper ads filled in the gaps when stories were not being reported in the media. Taking out national ads in the New York Times, Chicago Sun Times, and USA TODAY called out to the nation what was going on in Wisconsin. 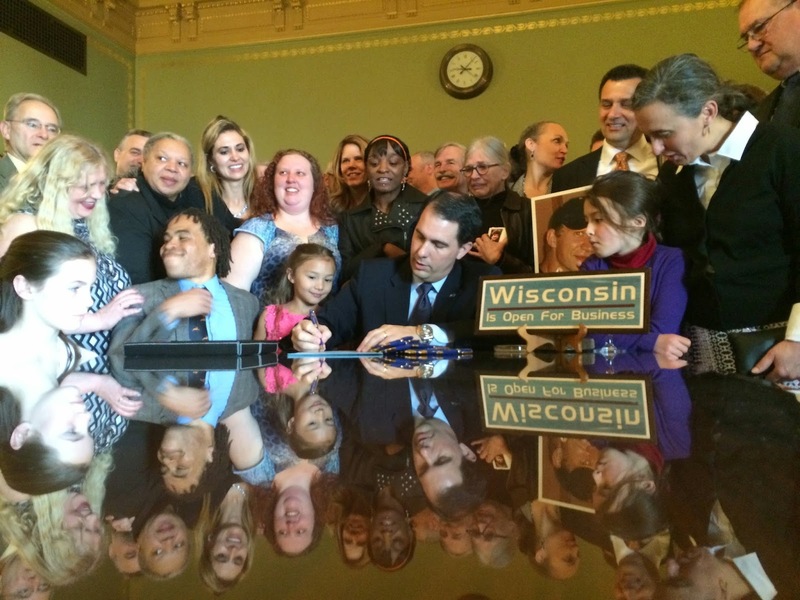 What was it like to attend the event when Governor Walker signed the new law? It is important to know that there were very fine police officers on the inside of the blue wall that also lobbied for this bill. As a number of family members walked past them, I shook their hands and thanked them for their support. I feel it was a healing moment for number of families that never fully recovered from the death of their loved ones. Governor Scott Walker signs the new law. Do you feel that more needs to be done? The original version of the bill hand three parts. Breathalyzer and blood test to insure the officer was in a clear frame of mind. An outside investigation of the death by experts not attached to the department involved and an independent review of the death by law professionals (retired DA’s, Police chiefs, law scholars and judges) appointed by a high ranking elected official to review the death. We were able to break through the wall and get the outside investigation portion and hopefully will have a chance at the other two portions in the future.